Is the Ioxus ultracapacitor module today’s better battery? 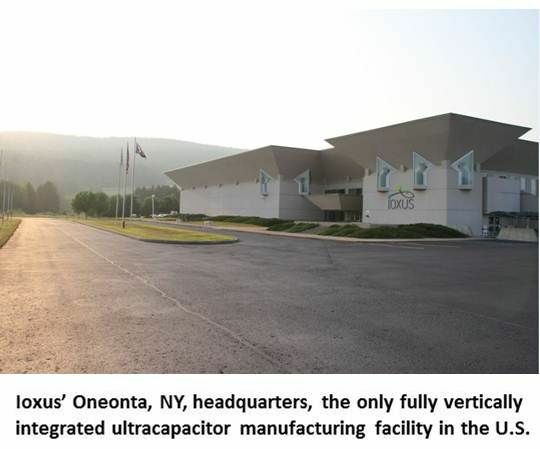 Ioxus has created an ultracapacitor module that will relieve its customers of the work of harnessing ultracap cells. A proprietary set of Ioxus technologies balances cell performances within the module. “It’s like having multiple horses pulling a sleigh and all the horses pulling in the same direction,” Ioxus CEO Mark McGough explained. Better than any such effort to date, according to McGough, Ioxus power electronics technologies harness ultracaps and balances the cells with lower equivalent series resistance, which he said translates to lower heat generation and higher power output. Ultracapacitors have become the power source of choice in wind turbine nacelles, where they power blade pitch control, the positioning of the blade in the wind. McGough said Ioxus supplies makers of “multiple megawatt turbines, 1.6 megawatts and up,” though confidentiality agreements prevented him from naming the manufacturers. Though wind turbine blades are long and awkward to reposition, it is vital to be able to adjust them quickly to allow them to grab useful winds. It is even more vital to quickly get blades turned out of potentially damaging winds. Ultracaps are ideal for such quick bursts of work. Manufacturers use Ioxus ultracapacitors in a variety of combinations. 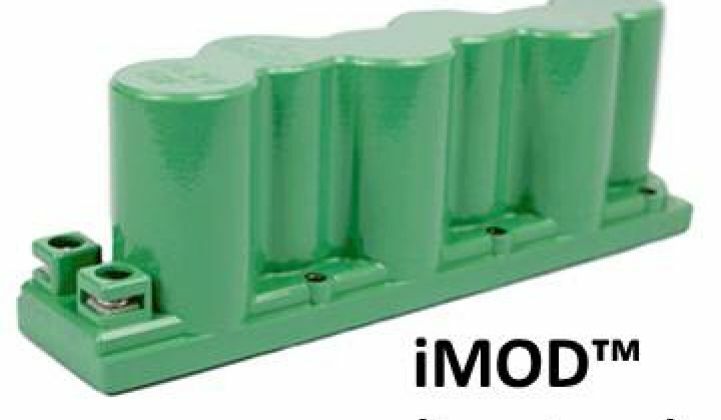 With iMOD arrays, the engineering needed to achieve whatever blade-moving power the turbine-maker wants will be more affordable because “they don’t have to become experts in cell balancing, one of our core competencies,” McGough said. And, he added, “it’s more rugged.” The module, he said, screws into the turbine’s superstructure. That is crucial in a demanding, high vibration environment like a wind turbine nacelle. Ultracaps, according to McGough, present significantly fewer materials challenges than batteries. They are “composed of some of the most common materials on earth, mainly carbon, which we buy in powder form, and aluminum, which we buy in sheets or in rolls.” Because they contain small amounts of electrolytes -- but no rare earth or toxic materials -- Ioxus provides a recycling service. An individual ultracapacitor is presently the power supply in today’s hybrid car “start/stop” application. When a hybrid vehicle comes to a stop, the internal combustion engine (ICE) shuts down, dramatically reducing fuel consumption. It is restarted by the electrical system, powered by an ultracapacitor that is recharged when the ICE resumes powering the vehicle. Ioxus is well funded. It just completed -- in April, "with ease" -- a series B financing round of $21 million. It is backed by GE, Conoco Phillips, NRG Energy, Alstom, Braemar Energy Ventures and Northwater Capital, among others. Companies that don't build ultracaps include EEStor.